‘Off The Leash’ will help you decide when to let your puppy run free, and show you how to let your dog or puppy off leash without him running away. We also look at differences between different dog breeds when it comes to off leash training and safety. And you can watch a helpful video of Pippa’s puppy learning to be off leash at nine weeks old. Letting your puppy, or a new dog, off the lead for the first time can be scary! [wp_ad_camp_5]What if my dog runs away? What if he won’t come back? What if my puppy gets lost? These are all normal worries and concerns. Fortunately with very young puppies they are mostly unfounded because small puppies are inclined to stick close to their grown up. When can I let my dog off the leash? There is a very real risk that the rescue dog you bought home last week, will run away if you let him off leash in an unprotected area today. As the bond between you grows, this risk diminishes, but there is much you can do to ensure your dog’s safety. The first step is to get your dog focused on you and make sure he is able to pay attention to you, even when there are interesting things going on around him. Start by training your dog simple skills such as ’sit’ and ‘come’, and ‘touch my hand’ at home in the safety of your house, yard or garden. [wp_ad_camp_2]Teach your dog to look at your face in order to get what he wants. 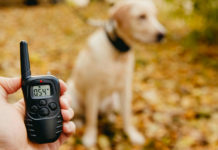 Once your dog is paying you attention and can manage these basic skills you can progress to letting him off leash outdoors, under the following conditions. You can progress to full off leash freedom once you are confident he will obey you. When you first allow your dog to run free, an ideal interim step is to have him wear a well constructed body harness and attach a training leash to the harness. Unless your dog has a history of absconding, you should let the training leash trail along the ground most of the time. Or if you want to take him into an area of high distraction where you think he may be tempted to ignore you. Some well-fenced and secure off leash dog parks can be a good way of getting started with free running for an older, confident dog. If he is difficult to catch, even in a confined space, then have him drag a training leash too, so that you can prevent him ignoring your recall. Busy dog parks are not ideal for small puppies or dogs lacking in confidence, especially at peak times. Though you may be able to use one at unsocial hours. In the UK where dogs can be off leash in most parts of the countryside, it’s important to have your dog wear a training leash until you are confident of your recall. Chasing rabbits and deer is a common problem in many breeds of dog and you need to be alert to avoid problems of this nature getting started. The same applies to off leash trails and open country in the USA where there may be less traffic hazards, but where predators and dangerous terrain post an additional risk to a dog chasing wildlife or running about unsupervised. 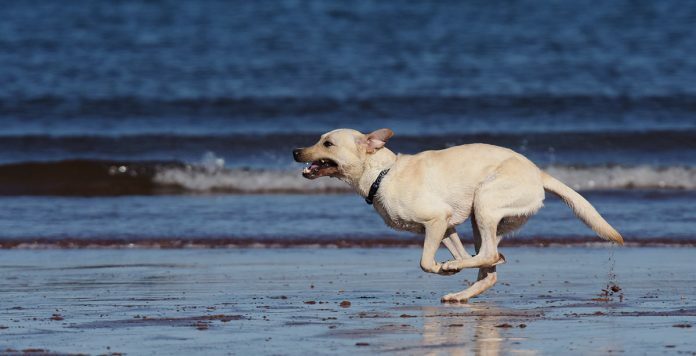 Running free on a beach, where permitted, can be ideal for place for a dog to stretch his legs. There is usually less risk of the dog chasing wildlife, and chasing seabirds is less of a problem because the dog never gets the reward of catching one. Beware of beaches with fast currents or mud flats. A dog running loose can quickly get into trouble. Again, the training leash, and plenty of interaction to hold your dog’s attention, is your friend. Far too many people are sold a puppy without being told of the importance of letting puppies off the lead from the very start. Small puppies have a strong desire to remain very close to their ‘grown ups’ and will normally follow any adult very closely when put down on the ground. This is a ‘safety response’ designed for their protection. Once a puppy is over four months old, this desire to cling to your legs diminishes with every passing week. New puppies can with a little common sense, be safely allowed to run around off the lead. 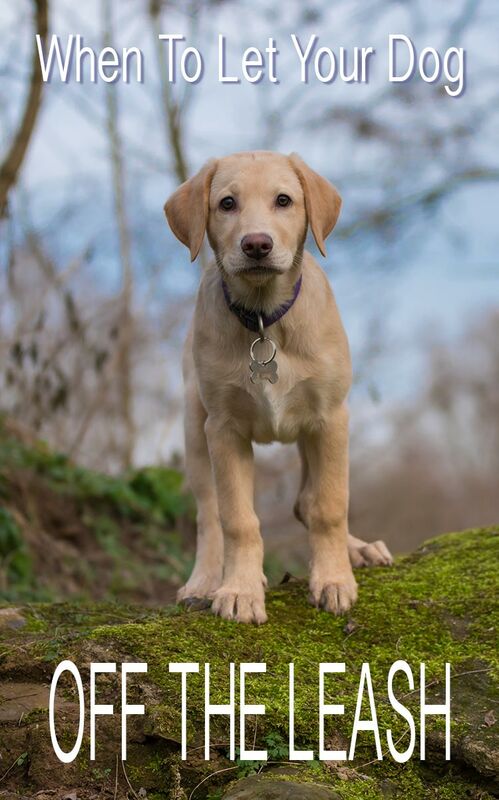 By eight or nine months of age, most Labrador puppies have bucketloads of confidence and little need for your protection on a minute by minute basis. This is not a great time to let a dog off the lead for the very first time. Towards the end of the first year of your dog’s life you should be putting the finishing touches on his off-lead recall, not just beginning to teach him how to come when he is called. Obviously you need to have access to a ‘puppy safe’ area to let your puppy off the leash at a very young age. A place where your puppy wont be at risk from catching a disease from a strange dog, or from being attacked by one. If you can arrange this, it is well worth the effort. Oh dear, is it too late? If you have made the mistake of keeping your puppy on the leash for several months, and if your almost mature pup has never run off lead, it is not too late to begin. Dogs can be taught to come when called at any age. Don’t forget, you’ll most likely need to use a training leash on your dog as an interim measure, whilst training him to recall. If you haven’t yet brought a dog into your life, you may be wondering if some breeds are better suited to being off leash than others. [wp_ad_camp_1]It is true that some breeds are easier to train off leash than others. We’ve already touched on the co-operative nature of our herding and gun dog breeds. 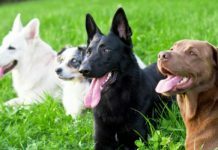 These groups of dog generally make very trainable off leash dogs. 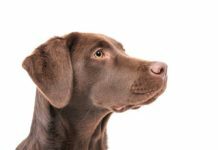 It’s also true that it can be harder to train a recall in dog that have been bred to chase other animals, including sight hound breeds like whippets and greyhounds. 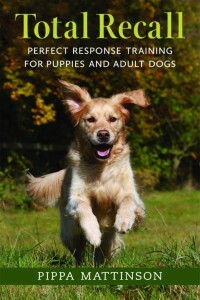 But almost all dogs can be trained to respond to their owner off leash, if they are started at an early age. You can find more information on recall training in our in depth guide “Teach Your Puppy To Come When Called“. I have also written a complete recall training programme Total Recall to help you establish a great recall with your puppy or older dog. 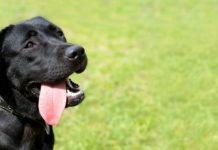 Previous articleCan Dogs Eat Bones – Are Bones Safe For Your Lab? I was walking my puppy in the field where I let him run around off the lead and this woman came in moaning with her two dogs that she just let off the lead! Saying I need to control my dog when he wasn’t doing anything wrong!? but I’m thinking why you coming to this field if you don’t want any other dogs around your dogs!? I wait till the field is empty and then I go in when the current people leave! Maybe she should have waited till I left!? She really upset me and I felt as if our walk got ruined by her drama and rudeness! My dog has many friends there where they all run! Maybe she should check the coast is clear before bringing her scared dogs to our small local field! I have been training my 10 month old female Lab with the whistle using your method since she was a young pup. She does great when it’s just her and I. If there are other dogs even remotely in the area, she may interrupt a recall or a fetch to charge after the other dog – just to play of course. I use marker training and either food or toy rewards, and she eagerly runs towards me when I blow the whistle. Add a dog in the mix and no amount of high desirability food reward will keep her mind on the game. I’ve even used the small tins of cat food, pure chicken, which drives her crazy, but nothing pulls her away from wanting to run with the other dogs which are mindfully playing fetch with their owners. What can I do at this point? There few places around where I live that are big enough fields to get some great exercise where there are not other owners exercising their dogs. Both of mine are pretty good at staying with me, the younger is best as the older is getting a little deaf so I have to be more careful with her, but what really bugs me is parks without gates. Is it really that hard to put a gate on? Then when that random cat leaps out of the bushes you stand a chance. They’re pretty good at “leave”, but the initial chase reaction has several feet before you can over ride it. I walk mine about 50ft into the park before I let them off, just in case. My 5 month old lab is brilliant coming to whistle in quiet woods but nightmare on the busy beach. She leaps up at people including a lady in her bathers today and hurt her legs. I can’ t trust her not to mess their clothes or knock over their kids. ShouldI be keeping her on leash on the beach. Luxury rewards don’t cut it either. Couldn’t agree more about letting pups off lead right from the start. As long as you monitor interactions with other dogs, your pup will benefit from the opportunity to explore the world with you at their side and it’ll let you start that recall nice and early too. I adopted a 3.5 month puppy and started training her recall in the house (no distractions). I moved it to the roof terrace next (few distractions), then a large public grassy fenced off area (communal area just outside pool and tennis courts) where people could walk past, come into the enclosure etc and she could see the road (more distractions). Finally at about 5 months I let her off on the beach. Initially she stayed very near me but I’ve been noticing her moving further and further before looking back to check where I am. I can still call her back most of the time, but when she sees a dog she sometimes refuses to return, instead, creeping closer and closer to the dog (she’s still a little timid of strange dogs but she really wants to greet them so she eventually crawls up to them on her belly). She hasn’t had a lot of socialization with other dogs – having come from a shelter where she was just with her siblings and the other abandoned puppies – and then because she hadn’t had her shots in the shelter (she had kennel cough and had to miss them), she had to wait until she was over 16 weeks before she started meeting other dogs. She’s quite good with dogs now but because she lacked contact with them at an early age and I don’t have any other dogs at home I think she’s extra desperate to meet and greet them whenever she can so it makes it very hard to call her back when she can see a dog (I have to see it first and call her back before we get nearer to it). She will come back on her own after she’s greeted and played with a dog for 5 – 10 mins so there’s no worries about losing her (if the other dog runs out of range of me she’ll return also) but this doesn’t help if the other dog is aggressive – I want to be able to call her off, ask the owner if it’s ok if they can play, and then let her off again if it is. Is there any way to train her to come back even if there’s something BETTER than food rewards (i.e. other dogs) in the vicinity? Hi Charlotte, training your dog to swap what she is carrying for food is the right way to begin. Once she does this willingly you need to add a ‘cue’ word such as ‘drop’ or ‘give’. The final stage is to ‘fade’ out the food rewards very gradually. Start by rewarding her nine times out of every ten, and gradually cut down the frequency of rewards until you only need to reward once or twice in every ten ‘gives’. Don’t eliminate rewards entirely. If your dog is very possessive, you will need to begin with high value treats, and mix in lower value treats gradually. Some dogs are not able to let go initially unless you hold the food right in front of their nose. Once the dog has dropped the toy, throw the food well away so that you can pick up the toy whilst she is running after the treat. Although I’m reading avidly everything on the Labrador site, I am in fact the owner of two Parson Russell Terriers, and a soon-to-be owner of a Working Cocker. Just wanted to say that as a trainer (mostly pet dogs, and now mostly retired) I have found all your articles brilliant! And of course the training applies to all breeds. However, your recall training procedures are like manna from heaven!! I’ve been telling owners similar stuff from the year dot, but very few have taken the techniques on board. I live on the coast and NEVER go to the beach as all the dogs are clearly out of control. I could say more…..! Thank you so much for the “Total Recall” book. I love it and have recommended it to dozens of others!